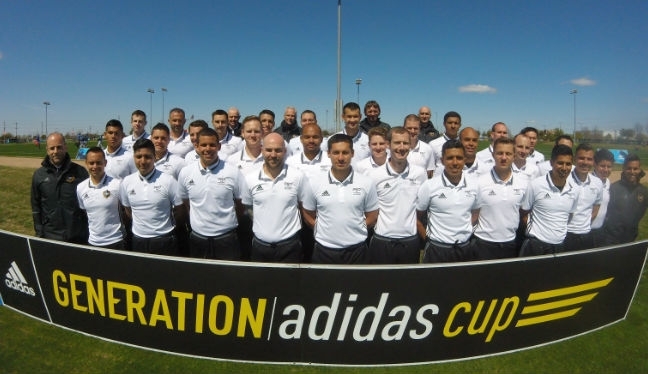 The Professional Referee Organization has held its first Referee Development Academy, at the MLS Generation adidas Cup. The Cup was held in Frisco, Texas, at the home of FC Dallas, and 30 officials – 16 referees and 14 assistant referees – were in attendance, making up PRO’s Academy. All are tier one or two prospects with ambitions to reach the top, and included the four newly-appointed MLS ARs on PRO’s roster. The tournament, which featured the likes of Villarreal (Spain), Aspire Academy (Qatar) and River Plate (Argentina), ran from March 18 to March 26 and provided the officials with a competitive environment to show their potential. PRO General Manager Peter Walton told proreferees.com: “With the ongoing expansion of the professional game in North America, it is vital that PRO, in conjunction with USSF and the CSA, identify potential match officials of the future. Each game at the tournament had a mentor or coach assigned to watch, who then supplied feedback to the match officials, helping them analyze their performances. PRO held group debriefing sessions in which the officials were given access to videos of their games, providing them with an opportunity to pick out teaching points to discuss with peers, coaches and mentors. PRO’s Match Official Development Manager Brian Hall led the delegation and directed the debrief sessions with the match officials. PRO Referee Manager Michael Kennedy and Training & Development Manager Paul Rejer were also present, giving insights into the direction given to PRO match officials who work in MLS. Current MLS officials Armando Villarreal (referee) and Chris Strickland (assistant referee) also attended, to offer their perspective. This gave the Academy officials a great opportunity to learn from the best, and to hear the trade secrets that will assist in making their transition to the professional level much more smooth.